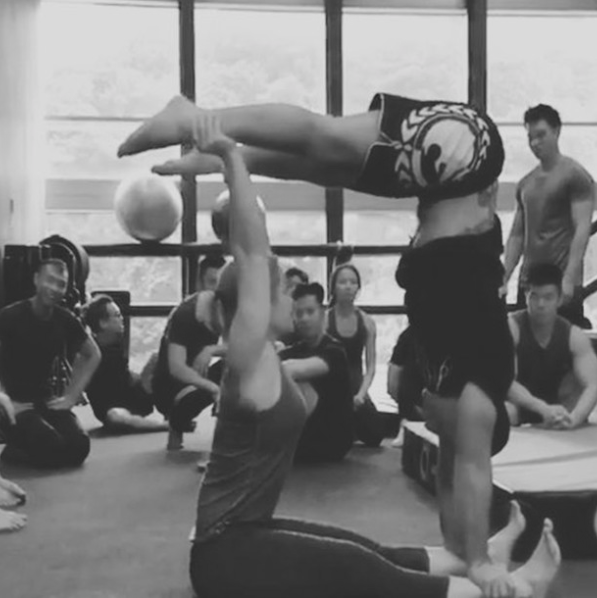 This weeks challenge is brought to you from the Agatsu acro circus workshop we will be giving at our Bali event this February that will also feature handstands and flow. The base lays down on their back and supports the flyer who is holding a push-up position. The base performs a sit-up while the flyer moves into pike. Try ten reps each switching base and flyer. TAG AND SHARE WITH A FRIEND WHO YOU WANT TO DO THIS WORKOUT WITH VISIT AGATSU.COM FOR ONLINE TRAINING.